call the mTouch. The mTouch is a fully interactive multi-touch table which allows multiple users to simultaneously interact with virtual objects using their fingers through gesture recognition. The interactive tables are self-contained units that combine our unique hardware and software technology. Merel Technologies focuses on innovation, customer satisfaction, affordability and quality. The mTouch is designed to take the place of a traditional coffee table or walk-up kiosk and provide businesses with a innovative and creative way to showcase or market their companies’ products or services. Additionally, our tables are built to last by using LED lights and LCD screens instead of projection technology. This increases the lifetime of the tables exponentially. Our interactive tables can be used in a range of settings, and are well suited for installation in public areas such as lobbies, restaurants, bars, entertainment venues, and waiting rooms. 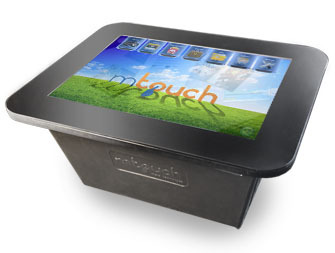 The mTouch is assembled and manufactured in the U.S.
Merel Technologies is focused on providing businesses with creative and innovative new methods for delivering their products/services to their clients, potential clients, or visitors. Till now high-end interactive displays and furniture have been expensive and not able to adapt to the changes and needs of the customer. We bring the use of multi-touch technologies in an affordable and attractive package called the mTouch. Merel Technologies is about connecting businesses with customers through technology. Whether its enhancing your visitor’s experience, showing a product to a potential new client or marketing new services to existing clients our team will answer all your questions in your mTouch deployment. Merel Technologies © 2010-11. All rights reserved.